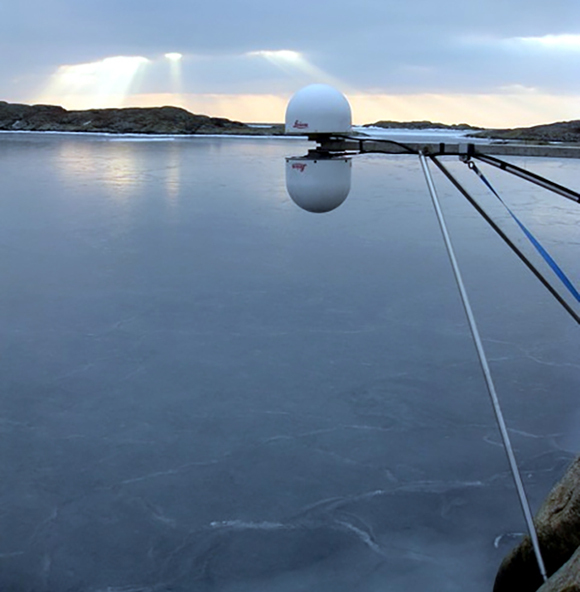 Ground-based GNSS sites with the appropriate geometry can measure the extent of sea ice. The method relies on measuring the signal to noise ratio of the satellite signal that reflects off of the ice and into the GNSS antenna. 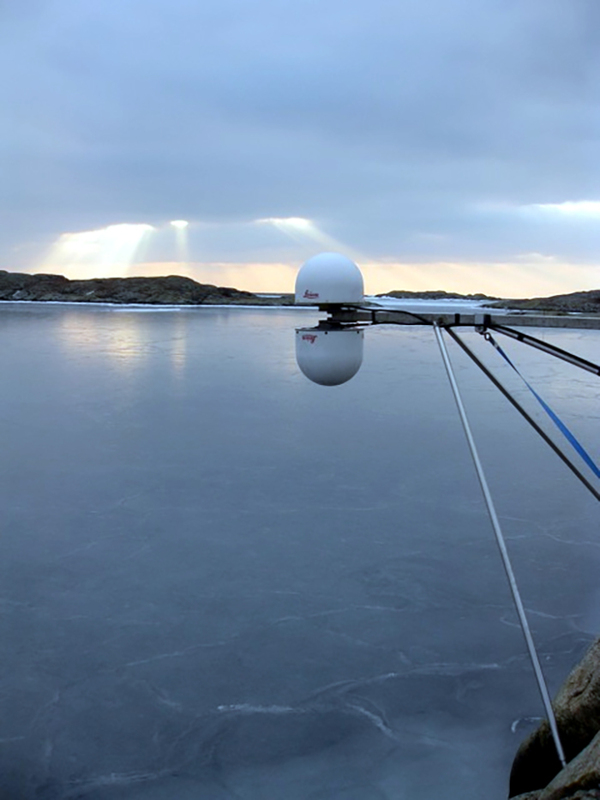 A single GNSS site, GTGU, situated on the coast of a bay at the Onsala Space Observatory, Sweden, measured sea ice extent over a three-year period. Thus a new method using existing or purpose-built infrastructure can be brought to bear on measuring sea ice and other critical variables in a changing climate. Global Positioning System (GPS) Interferometric Reflectometry (GPS-IR) is an expanding technique for measuring many important variables while taking advantage of sites and networks designed to measure other things. The method involves using the satellite signal from a growing number of Global Navigation Satellite Systems (GNSS) constellations that reflects off of a surface into a GNSS ground-based site antenna to measure a property of that surface. 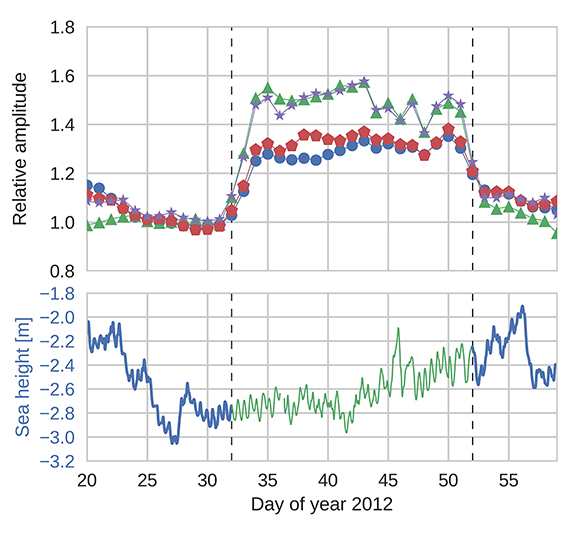 Here the authors use reflected satellite signals from the American GPS constellation and the Russian GLONASS constellation to measure sea ice for a coastal site on a bay that typically develops an ice layer in the winter. They called their method GNSS-R and they use the patterns in the varying signal-to-noise ratio of the reflected satellite signal to determine the extent of nearby sea ice. Visual inspections, temperature measurements, precipitation and snow depth measurements and ice maps provided observations of the bay and any development of sea ice. The bay was covered in sea ice in the winters of 2012 and 2013, ice-free in 2014 and 2015 and partially covered with ice floes in 2016. The signal-to-noise ratio of the reflected signal was analyzed during these times to determine whether the sea ice could be detected. 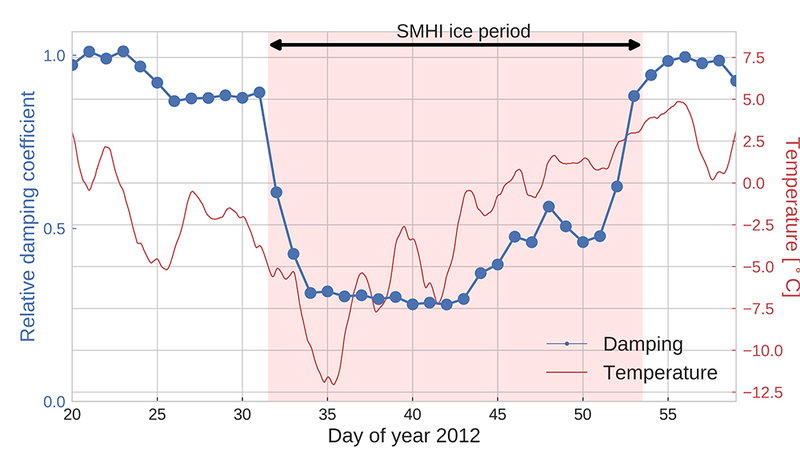 There is a clear correlation between the damping parameter of the signal to noise ratio and the extent of sea ice. Geodetic techniques can be used to measure sea ice and related parameters, helping to understand changing conditions as the weather and the climate changes. Joakim Strandberg, Thomas Hobiger and Rudiger Haas, Coastal Sea Ice Detection Using Ground-Based GNSS-R, IEEE Geoscience and Remote Sensing Letters, v14, no9, 2017, doi:10.1109/LGRS.2017.2722041.